Woodworking has always been a part of Jerry's life in one form or another, but about 15 years ago he happily became involved in hand carving. Desiring to carve a carousel horse for his wife, she introduced him to a local chainsaw carver. After a trip to Ridgway, Pennsylvania in 2003 for the annual Chainsaw Carving Rendezvous, Jerry was smitten by the camaraderie of the chainsaw carving community. He witnessed the launch of the United Chainsaw Carving Guild (UCCG) at Ridgway, which inspired him to become active in this organization at whatever level possible. In 2005, he became a UCCG Board Member, a distributor for RedMax Detail Carving Chainsaws, a distributor for Save Edge Files Co., and an Event Judge for the "Master of the Chainsaw" sponsored carving competitions. 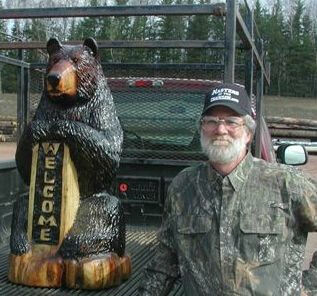 In 2006, he was honored by being elected President of the United Chainsaw Carving Guild. In his quest to gain knowledge and skills, Jerry, participated in 26 events, met over 450 carvers, drove over 30,000 miles, and judged 5 events in 2005. His carvings can be found in 22 states. Travels with his family team, including children Remington, Cheyenne and Autumn, have spanned to three corners of our nation over the last 2 years. They all consider it an honor and luxury to have raised and donated well over $10,000 for various fundraising organizations across the country. A fellow carver prompted Jerry to read about The KatRita Wood Project. "I was impressed by what it stood for and could accomplish for the people of the area. I feel so strongly about family that I didn't want to miss this opportunity to contribute to other families," says Jerry. So much so that he left his traveling team behind to watch over his newborn son, Sawyer. "I am happy to share my talents and hope that I can contribute to the trend of carvers coming to help the good people of KatRita Wood."